Main focus: contribution to the preparation of the Commission proposal for the Multiannual Financial Framework (MFF) with regard to cloud computing and software technologies in the context of the next research and innovation framework programme (FP9) and the digital aspects of the forthcoming Connecting Europe Facility (CEF2) programme. The MFF will define the EU budget from 2021 until 2017 (assuming a 7 year framework). Policy highlight in the period: adoption of the legislative proposal on Free Flow of Non-Personal Data in September 2017. The Unit (19 people) is a “hybrid unit” focussed on policy-making and on research/innovation in the Cloud Computing and Software sector. Policy highlights: development of the legislative proposal on Free Flow of Non-Personal Data, and implementation of the EU Cloud Computing Strategy of September 2012, including the launch of the European Cloud Partnership and the Cloud Select Industry Group. Research and innovation highlights: preparation and implementation of EU-funded research and innovation programmes (FP7 and H2020) for cloud computing and software technologies. Responsibilities: support the Head of Unit in setting the priorities and objectives of the Unit as well as its management. Achievements: launch of the Cloud Select Industry Group; encouraged stronger engagement of new stakeholders (e.g. data centre operators); provided inputs for the preparation of the Digital Single Market Strategy and the Free Flow of Data Initiative. Liaised with stakeholders on research and innovation issues in the context of the H2020 Public Consultations in 2013, 2014 and 2016. Engaged with industry representatives and trade associations (e.g. Digital Europe and Euro Cloud). Launched an “industry group” consisting of 15 large industrial organisations aiming to identify research and innovation challenges in the cloud computing sector to be addressed in the H2020 Work Programme 2018-2020. Research programmes implementation, including coordination and quality control of FP7 and H2020 proposal evaluations, negotiations and subsequent project launches (FP7 Calls 8 and 10, H2020 proposal evaluations in 2014 and 2016). In March 2013, mission to Brazil, as part of a team (EC officials and external experts) to carry out the evaluation of the 2nd EU-Brazil Coordinated Call for Proposals. While in Brazil, established EU-Brazil cooperation on policy aspects of cloud computing and software (standards, certification, interoperability, security). Organised a Cloud Computing Workshop in Brasilia (Nov 2013) and an EU-Brazil Workshop in Brussels (Nov 2014). Launched a cluster of EU-Brazil projects focused on cloud computing in January 2016. The Unit (20 people) focused on research and innovation on Networked Media Systems. The Unit did not have a formal HoU between September 2010 and October 2011. In this context, I was the Acting Deputy HoU for 13 months (since Sept 2010). Supported the newly appointed Head of Unit (November 2011) drawing upon my experience and knowledge of all technical dossiers related to Networked Media Systems. Recruited staff and prepared the Unit Management Plan. As Deputy HoU, I was involved in all aspects of management (personnel, technical, financial and contractual matters) in a context of change and reorganisation of the whole Directorate General INFSO. Contributed to the Working Group launched by the new INFSO Director-General on Integration of Competitiveness, Strategy and Business Needs aiming to identify inputs for the H2020 Work Programme 2014. Supervised the preparation of the Call text and the evaluation of proposals in the context of the Competitiveness and Innovation Programme (CIP PSP). Launched EU-Brazil cooperation activities in the pioneering field of Hybrid Broadband Broadcast (HBB). Responsible for international cooperation aspects related to Networked Media Systems, in particular with China and Latin America. Managed four FP6 IST Call 4 projects (€21.0 million budget) and four FP6 IST Call 6 projects (€6.0 million budget). These FP6 Call 6 projects focused on international cooperation with China on mobile broadcasting standards. Negotiated and managed three FP7 ICT Call 1 projects (€10.0 million budget) on 3D video technologies for fixed and mobile broadcasting applications. Launched a Support Action addressing international cooperation with Latin America on Networked Media Systems, including digital TV aspects. Responsible together with the Deputy HoU for the coordination of the FP7 Objective ICT-2009.1.5 Networked Media and 3D Internet (€80 million budget). Negotiated four FP7 ICT Call 4 projects (€16.5 million budget) on Networked Media and one Support Action on international cooperation with Uruguay and Colombia. Commission representative to the DVB Project (Geneva, Switzerland), where the next generation of digital terrestrial and satellite broadcasting standards was developed by the European broadcasting industry. Strengthened links with ETSI standardisation activities on Media Content Distribution. Contributed to the promotion of DVB digital TV standards in Latin America. Contribution to the EU-Japan bilateral discussions on the Future Internet in October 2009 (Tokyo, Japan) and in October 2010 (Tampere, Finland). Co-responsible for the coordination of the FP7 Objective ICT-2011.1.5 Networked Media and Search Systems (€70 million budget). Negotiated three FP7 ICT Call 7 projects (€10 million budget) on Networked Media Systems. European Commission: January 2003 to February 2007: Programme Officer, INFSO.D1 Mobile and Wireless Systems. Managed eight FP5 research projects (€17.4 million budget) and four FP6 Call 1 projects (€20.0 million budget). Negotiated and managed four FP6 Call 4 projects (€17.0 million budget). All these projects were in the area of Mobile/Wireless and Broadband Communications, including satellite communications systems. Contributed to the drafting of a Commission Communication on Mobile Broadband Services (June 2004). Work on telecom regulatory matters, in particular radio spectrum aspects of mobile and satellite communications. Contribution to the work of the EU Licensing Committee, the Radio Spectrum Committee and the Communications Committee. European Commission representative to the European Conference of Postal and Telecommunications Administrations (CEPT). Drafted a Staff Working Document on ‘infrastructure sharing’. Introduced the concept of ‘network infrastructure sharing’ in a Communication from the Commission (March 2001). The sharing of network infrastructure facilitated the rollout of 3G mobile networks in Europe. Co-drafted a Commission Recommendation on the provision of public R-LAN access services (adopted in March 2003). The Recommendation was intended to encourage EU Member States to allow the provision of public R-LAN access services (WiFi). Responsible for the areas of GSM and satellite communications within the newly established International Standards Department. Carried out the recruitment of additional engineering staff, organised the operations of the new Department and co-ordinated the involvement of NEC Europe in the standardisation activities of ETSI. 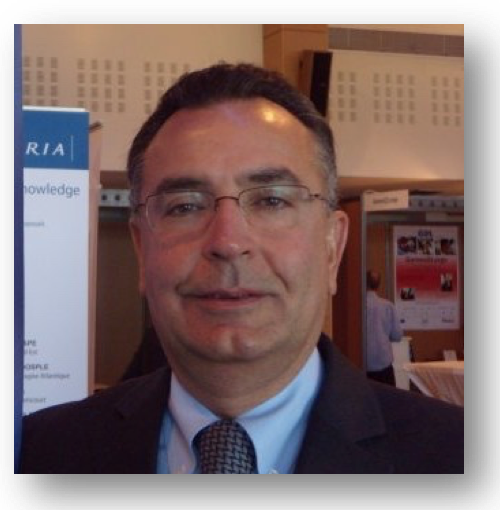 Head of the NEC delegation to the ETSI SMG Committee, responsible for the standardisation of GSM and 3G (UMTS) mobile communications systems between 1993 and 1998. NEC representative to the ETSI Technical Assembly and General Assembly from 1991 to January 2000. Department Manager of the Radio & Wireless Department (April 1995 to June 1996). The activities of the Department encompassed mobile communications, wireless ATM systems, fixed wireless access, satellite communications, terrestrial microwave links and electro-magnetic compatibility. General Manager of the Telecommunications Technologies Division (TTD) from July 1996. The Division consisted of three Engineering Departments (IP and ATM switching platforms; 3G mobile communications systems, broadband satellite and wireless access networks; optical transmission and broadband fixed access networks) and two Support Groups (IT and Administration). Full responsibility for engineering, administrative, financial and personnel management within the TTD Division, reporting directly to the NEC Europe Managing Director. Responsibilities encompassed project/product design and development, including client contact, proposal preparation, contract negotiation, project planning and project financial control. Secured new contracts and ultimately became responsible for about 5% of the overall ERA Technology order intake (annual turnover of US$20.5 million) during the financial year 1989/90. Visiting Professor at the Department of Electronic and Electrical Engineering, University College London, sponsored by The British Council in July/August 1985. ITU Fellow with the US Telecommunications Training Institute, Washington DC. Course: Telecommunications Transmission Systems and Technology sponsored by Rockwell International in Oct/Nov 1984. Fulbright Scholar with the US Telecommunications Training Institute, Washington DC. Course: Satellite Communications Management, Applications and Technology sponsored by COMSAT Laboratories and by Hughes Aircraft in Sept/Oct 1983. Barlow Prize, awarded by the University of London (University College London) for the most original contribution to research in the Department of Electronic and Electrical Engineering during the academic year 1982/1983. PhD in Electrical Engineering from University College London (millimetre-wave systems and devices). MSc Telecommunications, Pontifícia Universidade Católica do Rio de Janeiro (CETUC), Brazil. Member of the Institution of Engineering and Technology (IET, UK).